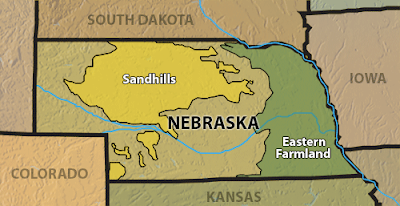 "Pack an extra bottle of water, and say your prayers" was the advice from our waitress as we enquired about the section that lay ahead in the Sandhills traveling north to Valentine, NE. 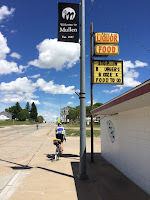 As we finished off our burgers at Paul's Liquor and Food in Mullen NE, an interested patron pointed out that we could always drink from the stock pumps. He has all his life and he's just fine. 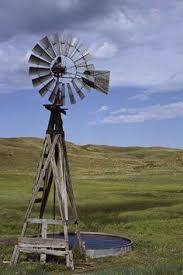 These windmill pumps supply thirsty cattle with a cool endless stream of water throughout the Sandhills. Just a note of caution, collect the water as it comes out of the pipe. Don't drink from the trough or pool itself. 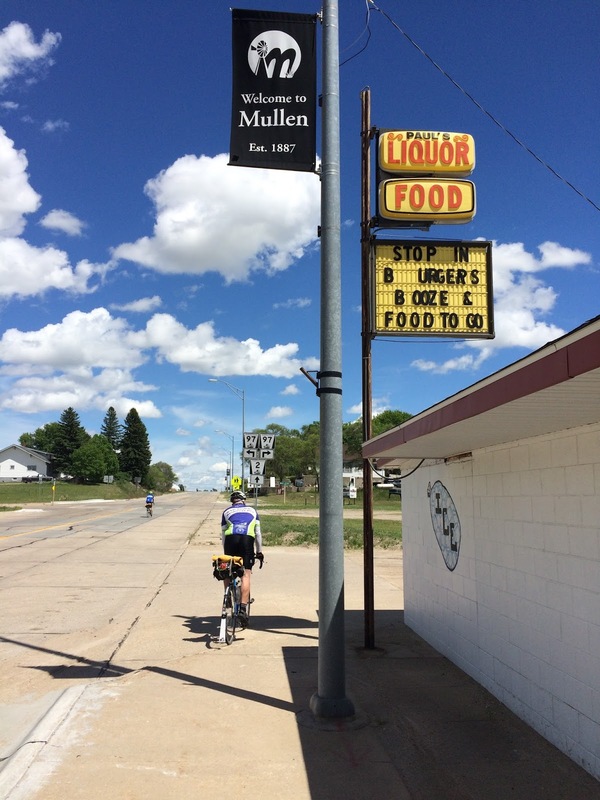 Nebraska is known for corn and beef cattle but it might as well be recognized for great cycling. RBA Spencer Klaassen mapped out and guided us through a 1,000k adventure that highlighted the Sandhills but included varied terrain from vibrant wetlands teaming with wildlife to a near alpine climb up to over 4,600ft elevation at Piney Ridge. This inaugural edition of the Sandhills 1,000k included 8 riders from 7 different states who came with eyes wide open to capture the panoramic views. 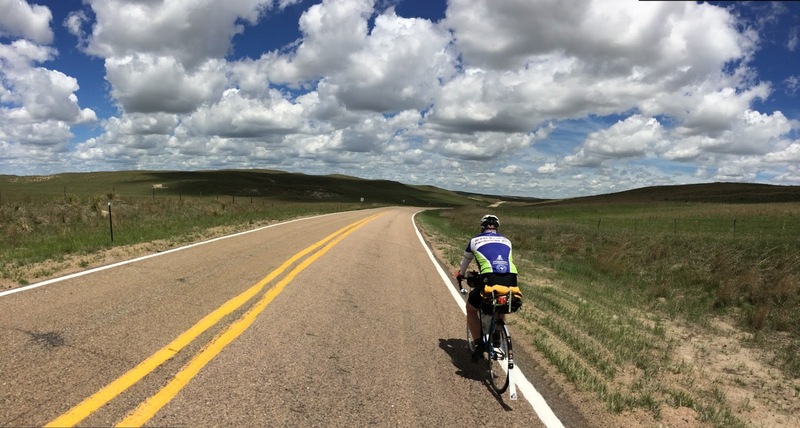 Riding in Nebraska may not be on too many bucket lists, but it should be. The sparse population density results in nearly empty roads. We completed a 100k night section and didn't see a single car. That section from Alliance to Hyannis parallels the railroad, which is a major east west route with trains passing every 10-20 minutes. Train horns work better than caffeine to keep the weary randonneur alert. The south/north direction through the hills is significantly more challenging than the east/west. Even the "busy" roads carried very little traffic but provided a wide shoulder protected by rumble strips. The road surfaces were mainly smooth although some extended sections include frost cracks. Something to consider when choosing tires. 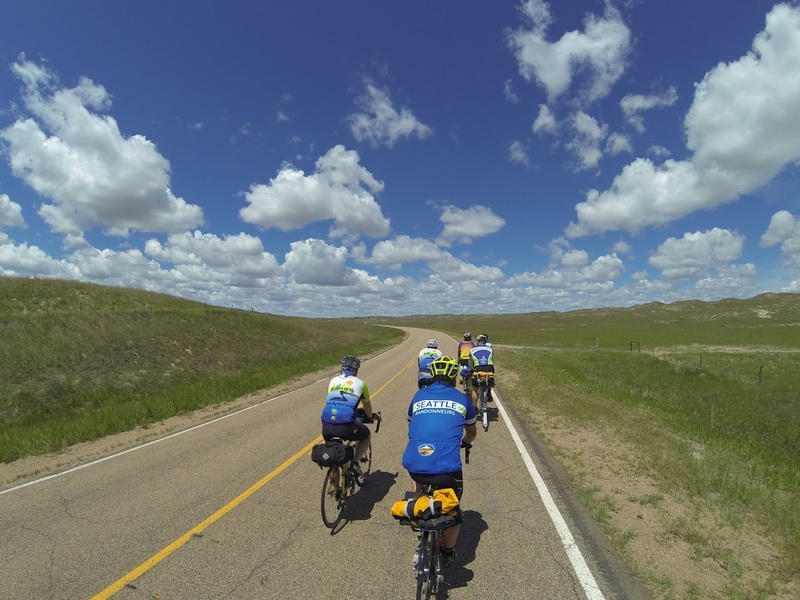 The posse heads north through the Sandhills on Day 1. The night sky was mesmerizing, particularly from Valentine to Merriman up near the South Dakota border. The sky stretches from horizon to horizon with essentially no background light pollution to obstruct your view of the Milky Way. I found the rumble strips more than once, as the night sky was demanding my attention. At one point I just stopped to look at the sky. It was that special. In addition to the natural beauty the route included cultural sites as well, including Carhenge, the world's smallest courthouse and the only straw bale church in the US. Challenges of the ride include long sections of hills, lack of shade, wind, storms and limited services. Debe and Rick Dockhorn provided roving camper support at key locations of extended sections without services. Volunteer Billy Coates adeptly managed our drop bags and coolers and staffed the overnight controls. The absence of a motel in the optimal sleep stop after a long day one did not deter Spencer as he cold called the local bank and arranged for us to rent out a house from the mother of one of the employees. They even provided breakfast burritos and monkey bread! The fee? "Leave a donation of whatever you think appropriate." Who rents their house out to complete strangers that will arrive after 1 am and be gone by 7am without settling on the cost? Oh, and provides breakfast. Nebraskans do. Corn Huskers are a friendly bunch. They were genuinely interested in what we were doing and in our safety. On the road they always pass with care, mainly in the entire opposite lane. Off the road they shook our sunscreen soaked hands, asked many questions and even let us fill water bottles in their kitchen sinks. At mile 575 as we entered a Sinclair station I held the door for a woman and her daughters. They started a conversation and wanted to know all about our ride. When I told her that our destination for the night was Broken Bow she got a concerned look and asked if I thought we would miss the storms. I hustled inside and Spencer pulled up the radar. It did not look good. We were in the direct line of fire. Every single person that came into that station advised us to stay put. A storm was heading our way with 65mph winds, hail, rain and it had already spawned one tornado in Oshkosh. 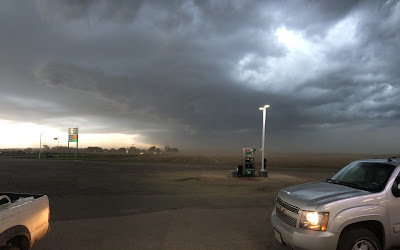 We sat at the large plate glass windows and watched the storm come through led by a wall of dirt that was being pushed along. It was impressive and mainly passed in 30 minutes. When we returned to the road a full double rainbow greeted us! After the storm, 50 miles to the pot of gold! Perhaps you are familiar with the "bystander effect". This is the psychological phenomenon that has documented that people will not intervene in emergencies due to diffusion of responsibility. 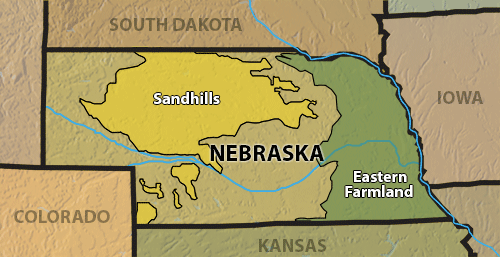 This is not in effect in Nebraska because there very well might not be someone else to help. I'm convinced this is why we had so many people tell us to stay put at the convenience store. Our group had the good fortune to include a native Nebraskan, Rodney Geisert. 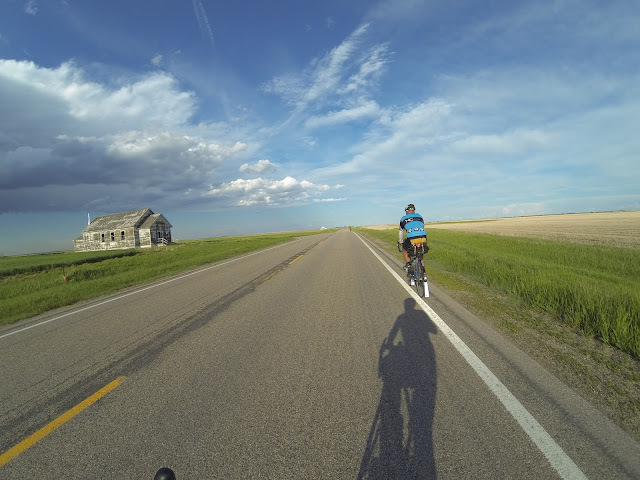 He grew up on a farm in Kearney, not more than 30 miles off our route at one point. He recounted a story of a neighbor farmer getting his hand trapped in a piece of farm equipment at harvest time. He wound up with a significant injury and was admitted to the hospital. Rodney's father and several other farmers drove over in the combines and harvested the injured farmer's crops, before their own. That is what it is like to live in an area where you rely on others. They watch out for you too. Rick Dockhorn from Lincoln NE contacted his aunt and uncle who live in Broken Bow, our start/finish town. They offered to provide a pre-ride cookout at their home a short walk from our hotel. 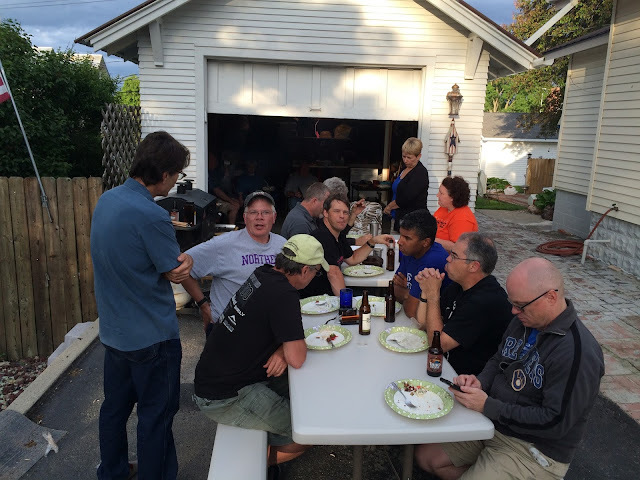 Pre-ride cookout in Broken Bow courtesy of Rick's aunt and uncle. We stuffed ourselves with flame grilled burgers and dogs and heaped on the homemade sides. A local sampling of microbrews completed the festivities. Our names, home towns and occupations were gathered for a story in the local paper. I'm not sure if Nebraskans love cyclists or they just love people. It doesn't really matter though. You are sure to be welcomed with open arms. The ride is challenging. Although the climbing total was only a little over 18,000', it feels like much more because often we were climbing into the wind. The weather will definitely come into play. Make sure you have a good radar ap on your smart phone. Ensure that you are receiving severe weather warnings. Go up one tire size from what you normally ride if it is less than 28mm. An extra water bottle is not necessary but could come in handy. High SPF sunscreen is mandatory as you will be in the sunshine nearly constantly. Sun shade arm and leg warmers/covers would be ideal. Shade is not a thing in Nebraska. I feel fortunate to have been a part of the inaugural Sandhills 1,000k. It is truly a unique area of the country to ride a bike. The lack of auto traffic is conducive to extended smiling. 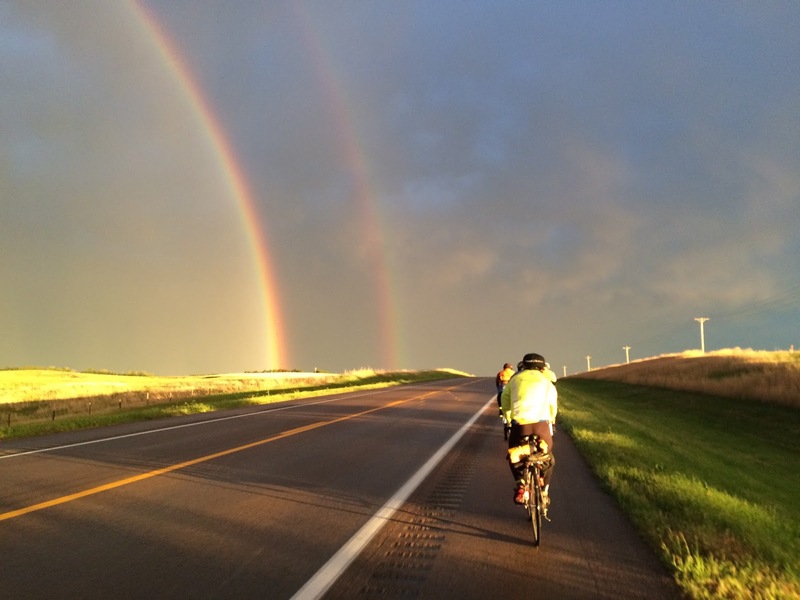 You may have never considered riding in Nebraska. You should reconsider. Spencer leads us into the heart of the Sandhills. Love this write up, Cap'n. Sorry to have missed the adventure, but I've just added this one to my "bucket list," for sure. I fondly remember my one trip to the Sand Hills region to see the cranes one spring. That is a magical place.